Although diversity and inclusivity is not yet the norm in fashion, there are some key movers and shakers looking to make this happen. One of our favorite people in the industry is Carrie Hammer, the designer who has made history multiple times at New York Fashion Week for shunning models and using badass women and role models instead. Her diverse list include a quadruple amputee, a down syndrome actress and a woman in a wheelchair. Essentially she has set the bar high for other designers and labels to show how they too can be representative of the wider consumer base that buys fashion, than the narrow beauty ideal that often gets portrayed in magazines and on billboards. Now we have another brand to add to the slowly growing collection – The Limited. For their latest range, they have designed it for women in leadership and called the collection ‘The New Look Of Leadership‘. 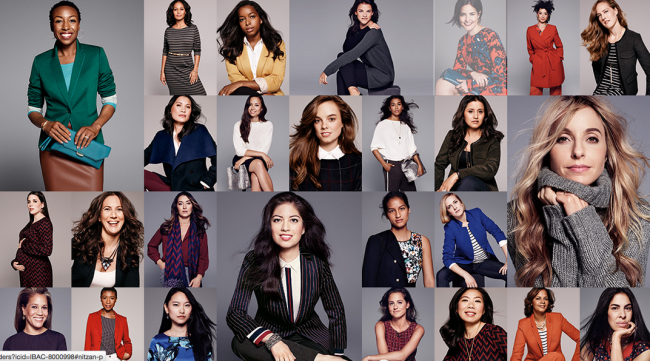 Featured in the campaign are 60 women who are leaders of varying levels from a range of industries including education, technology, entertainment, business, government, healthcare and more. Here’s why this campaign is important to us, and for women everywhere: because when we can admit that we can readily identify a supermodel, a superstar basketball or football player, a reality star or a chart-topping popstar, but not industries that actually affect our everyday lives such as the aforementioned, we need to take stock of where our priorities lie and what message we are sending to young women. Let’s be clear, entertainment and fashion are not evil, in fact art and creativity is extremely important in the world. But when that is the only thing we focus on and have no idea how public policy and health care mandates can be the difference between prosperity and poverty for millions of people in a country, there is a need to balance the scales a lot more. So The Limited decided it was a great time to show their customers and many other women what the face of leadership looks like in other areas of society in a bid to inspire them. The idea came from a conversation with some of their loyal consumers. “We discovered there are so many great female leaders among them. We wanted to recognize these outstanding women and launch a movement to inspire others to lean in their own communities,” said Diane Ellis, chief executive officer of The Limited. One of the women featured was wellness guru Gabby Bernstein who told the Huffington Post what it meant to her being included in this awesome list. “I am deeply passionate about inspiring women to own their leadership power and rise up. I’m grateful that The Limited is bringing the empowering message of women and leadership to the forefront. Fashion and leadership go hand-in-hand when it comes to making an impact, leading with confidence and owning your power,” she said. This campaign also wants to expand the definition of leadership. We often think of leadership as someone who has the power to influence others. Going back to the idea of celebrities, we all know how much influence and power they hold in the world today, but let’s not forget how men and women in other sectors are making a difference and creating change in other ways. In essence, this is the spirit of The Limited’s message. “Leading is a way of approaching life–and in today’s world, there are infinite shapes it can take. It’s time the definition fit them all. So we’re calling on leaders of all types to help build a vibrant community of inspirational women. Together, we will re-create the picture of empowerment to reflect the authentic, modern leaders we see every day—answering the question, “What does leading look like?” with you. And her. And us,” says a description on the site.